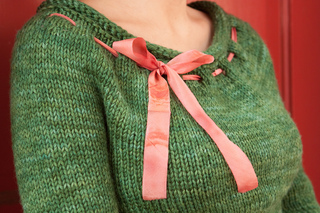 Top down yoke construction with hourglass shaping and a gather under the bust. Works well with Miss Babs Yowza hanks, which are 560 yards each! Yardage is quoted for worsted weight yarn held double. Work even until sleeve measures 8.5 (9.5, 10, 10.5, 11) inches from underarm, or one inch from desired length. Purl one row. 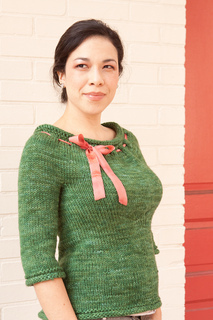 Knit for six rounds. Bind off sleeve.